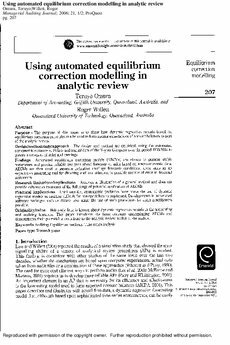 Copyright 2006 Emerald Group Publishing Ltd.
Purpose - The purpose of this paper is to show how dynamic regression models based on equilibrium correction principles can be used to form auditor expectations of account balances as part of the analytic review. Design/methodology/approach - The design and method are empirical, using the automated econometric software of PcGets and annual data of the Toyota Company over the period 1950-2004 to generate forecasts of sales and earnings. Findings - Automated equilibrium correction models (AECMs) are shown to possess stable parameters and provide reliable one year ahead forecasts of sales based on macro-economic data. AECMs are then used to generate indicative earnings forecasts conditional upon sales as an expectation generating tool for directing auditors' attention to possible sources of error in financial statements. Research limitations/implications - Analysis is illustrative of a general method and does not provide exhaustive treatment of the full range of potential application of AECMs. Practical implications - Until recently, econometric problems have made the use of dynamic regression models in auditing difficult for non-specialists to implement. Developments in automated software packages such as PcGets now make the use of such procedures by audit practitioners possible. Originality/value - Relatively little is known about dynamic regression models in the accounting and auditing literature. This paper introduces the basic concepts underpinning AECMs and demonstrates their potential to contribute to the analytic review toolkit of the auditor.